I've never been able to push a really big gear; anything much over 100" is not much use to me. There must be plenty of people who can as, for instance, most off-the-peg 'sportive' bikes – a growing market these days – come with 12T or even 11T as the smallest rear sprocket. But paired with a large chainring of 50T or more this gives a top gear which, for me, is redundant. Shimano CS-HG50 Deore and Tiagra cassettes with HG53 chain. At the time of writing available for less than £50 online including delivery. My latest bike wasn't quite off-the-peg: most of the components were swapped on to a 51cm Kinesis Racelight T2 2010 frame from a 54cm Ridgeback Horizon for delivery on Chrismas Eve. I am not going to blame anyone else for my newest bike having a few compromises. And I should have pressed the bike shop for a woman's saddle (the Ridgeback-branded components were replaced with a range of others) so that Mrs Bailey might use the bike in the summer. By which time I would have broken in the Brooks B17 standard saddle she bought me for Christmas, and put it on the Ridgeback Panorama I hoped to get in the summer. Well, plans change and I'm unlikely to get another bike this year. 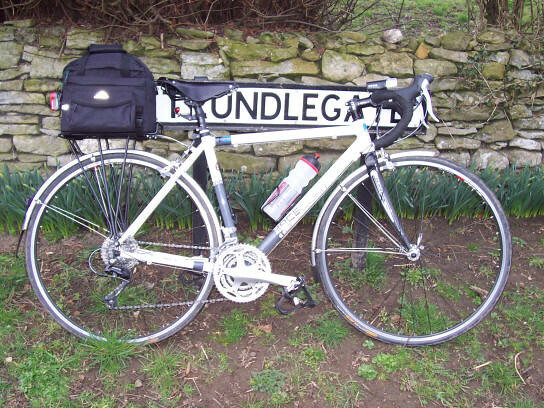 Instead I've slightly adapted this 'winter training bike' Kinesis in to a light tourer/Audax bike. I've added a pannier rack for a rack bag and a week ago I fastened on the fittings for a handlebar bag. But the most significant change has been to the rear cassette. I don't think compromise is the right word here. No, customise is the right word. This is an account of the simple steps required to swap a Shimano Tiagra 11-25 HG50 cassette for a Shimano Deore/Tiagra custom 13-34 cassette. My original Tiagra cassette went like this: 11/12/13/15/17/19/21/23/25. The two biggest gears were bigger than anything I was able to push with the 50T chainring even on long descents. And at the other end the 30T inner ring on my Sora triple chainset gave me a gear that let me manage the biggest hills locally, but I didn’t feel I would comfortably cope with on longer, steeper hills, say, during day rides in the Yorkshire Dales carrying the gear I like to take with me. My Sora triple is a standard 50/39/30. Apart from at the very top end – which I don’t use much anyway – there are no big jumps. And now when I’m using the big chainring I can make use of the 21T sprocket (giving me my preferred option of an inch gear in the mid-sixties) that wasn’t previously available to me from the large chainring. The six largest sprockets on a Shimano HG cassette are held together by retaining pins. They will need to be removed. Taking off the existing cassette requires a chain whip and a locknut tool. Slot the new sprockets and spacers on to the freehub. HG sprockets will only fit in one position because of the splines on the freehub body. If you break up two cassettes to customise your gearing some of the functionality of the HyperGlide system will be lost (the ramped edges that aid with downshifts will no longer be in synch). In practice I haven’t found this to be a concern. Reuse the retaining pins if you wish. However, they are mainly for convenience during initial assembly, and your locknut is there to keep the cassette in place. Ideally, you should use a torque wrench to tighten the locknut. If you use a large rear sprocket as big as my 34T, you may need to change the rear derailleur. I had a spare Deore mech, which can be picked up online for about £25. With 50/39/30 chainrings and 13-34 cassette I have a range of gears from about 104” to 24”. My Kinesis Racelight T2 2010. I had, briefly, considered replacing the chainset with a MTB version. However, there are compatibility issues with STI levers and mountain bike chainsets and front derailleurs. I’ve had to shrug off comments from sixty-something blokes in my local group; two about being able to get up brick walls and another about dinner plates. I’m not bothered. At the moment I’m neither fit enough nor light enough to cope with really steep hills without the option of a couple of gears below 30”. My original cassette gave me a top gear of approximately 124" and a bottom gear of 32", a difference of 92". 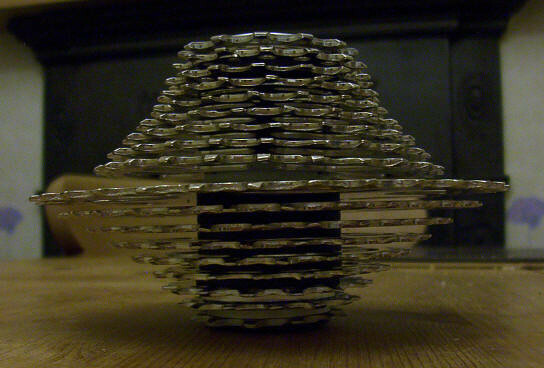 My custom cassette has a top gear of 104" and a bottom gear of 24", a difference of 80". So not only do I have narrower ratios between gears, I can now make use of them all. Posted by Chris on June 5th, 2010. Interesting. I did wonder why you didn't fit a different chainset but I suppose that would be more expensive. On compatibility: our Panoramas came with STI levers and Tiagra front mechs, then the rest is Deore. It works okay but the STI front lever has four positions. I've never worked out why, as my MTB lever has three and that bike has a Deore front mech (I'm not too well up on this sort of thing). I have a set of wheels I bought purely for touring, and the Deore XT cassette is 11-34 compared to the 11-32 plain Deore that came with the bike and which I use most of the time (I've since rebuilt these wheels with new rims and spokes). So with a 48/36/26 chainset my touring range is 118" to just over 20" and my normal range is 118" to 22". Incidentally, you couldn't really customise a Deore XT cassette because it's built on a one-piece spider for lightness. For info: with the bike fully loaded (weighing about 75lbs in all, plus me at 11 stone) my cruising speed on the flat is about 14 mph, using the highest gear of 118". Sandra never used her big chainring on tour. At the other end of the scale I use the 28-tooth sprocket with the 26-tooth chainring (25") to get up to my house at the end of every local ride. With the touring wheels on, my Panorama will definitely climb a wall. Patrick wrote: … my cruising speed on the flat is about 14 mph, using the highest gear of 118". But this would also probably mean a new front derailleur because the outer chainring at 44T is likely to be too curved for the Sora triple front mech. So I might have needed a new front mech, but what about STI levers and mountain bike (ie 44/32/22) chainsets? I understand that there are compatibility issues between STI levers and mountain bike chainsets/front derailleurs and the amount of pull required. Hence my decision to go for a cheaper, less drastic solution. Sorry Chris. Thinking about it, I may have got that wrong about using my highest gear fully loaded on the flat. I did use the highest gear at times though, and on the unloaded bike on the flat, I do sometimes use the highest gear. I've read about compatibility issues with MTB and road components but not really looked into it yet. My tourer has a Tiagra road mech with an MTB chainset but this has changed to all Deore on the current model. I might add a box to my (our) gear inch calculator so that speed can be fed in as an alternative to cadence. I had a Dawes Galaxy for years and I like a big low range. I just got a mountainbike 42,32,22 chainring and used that with an 11-32 (I think) cluster and that gave me what I wanted. I next went full MTB for touring, adapting a racing front suspension MTB for touring, raising and shortening the handlebar reach, fitting a carrier and fitting high-pressure slick tyres. It's doing the same thing, actually, giving us what we want rather than what the bike manufacturers think we might want!! One advantage of the MTB approach is that you can fit tyres of such width that pinch punctures are eliminated. I've never got a pinch puncture on an MTB. I've a Campag Chorus triple 53/42/30 with a Campag 13/14/15/16/17/19/21/23/26/29 – 10sp cassette. Top gear of 108" and bottom of 27". Gives a range of 81"
The bottom gear is low enough for me to get up the steepest of hills, and the top gear is ok for powering along the flat. I cannot imagine a better set of gears than I have. They are slick and quiet, change easily and quickly, and almost feel like silk. Was it cheaper to buy two cassettes than to buy a couple of replacement cogs? It seems a waste to do this. In the past, I had a Suntour Ultra freewheel and you could buy many different cogs. I had a bag of different ones to suit my riding for different occasions, and it was easy to swap them over as all you needed was a couple of chainwhips to unscrew the stack and screw on others. Each cog was not particularly expensive. These days, it's possible to buy Campag sprockets as spare parts, perhaps you can't do this with Shimano? Other than that, Highpath Engineering supply sprockets in all different sizes for both S and C setups. Either way, you seem to have come up with an ideal set of ratios. Hi, Mick. 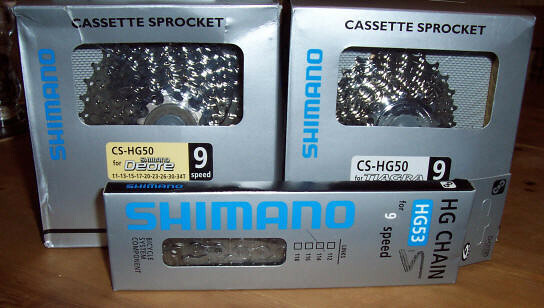 In the olden days it was easy to pick up sprockets for Shimano IG [edit: Uniglide] cassettes. But apparently there are so many permutations with HG (they are ramped differently depending on the intended size of the sprockets either side of them) and I couldn't be bothered to spend too much time looking for stuff online. So I used Chain Reaction Cycles and bought two cassettes that gave me exactly what I need right now including the 13T smallest cog and its locknut. The other sprockets aren't wasted. As I get fitter I may come down to a smaller large sprocket and use the intermediate sprockets from my stockpile. Thanks for the information on Highpath Engineering, though. I've bookmarked their site. Wow, what a coincidence. I am doing pretty much exactly what you have done to get my perfect audax bike with gears from 25" to 105" using a 13-32 (from a 13-25 and an 11-32), with a 52-42-30 chainset. Maybe there is a demand for this kind of custom cassette – see you on Dragon's Den. You would have noticed that misaligning adjacent sprocket ramps results in slower shifts. Fix is to grind down one side of the wide HG spline tab on some of the sprockets so that these can be re-oriented on the freehub with ramps appropriately offset. In your case you could retain the 17/19/21/23 Tiagra sequence and grind tabs off and re-orient all others, although it'd be slightly simpler to retain the Deore 23/26/30/34 sequence. I wonder if the good people on the previous posts can help me. I have a Trek 1.5 Triple (50-39-30), with an SRAM 11-26 rear cassette, and a Shimano Tiagra rear dérailleur. I read that I could use a Shimano 11-34 rear cassette on my group set, and have purchased one. I have fitted the cassette and attached a new chain. Now, when I change to the 2 lowest gears (30 and 34), I get a grinding noise from the err derailleur, almost as if the upper jockey wheel is too close to the largest cogs. Adjusting the B screw doesn't seem to make any difference. What am I doing wrong? Are you using a long cage rear derailleur? Usually you have to change the derailleur if you are fitting a much bigger cassette. Is the new chain longer than the original to take into account the larger 34 cog? Forget the above I see it's already been mentioned. doohh. Don't know if this is any use, but my rear mech (Shimano XT) has a screw at the back. I've never adjusted it but it looks as if it can be tightened to swing the whole mech further back to pull the jockey wheel away from the casette. I think one of my sons had this same issue and we fixed it this way. Hi, Simon. I'm not sure where you have read that, as technically you don't have a group set as such. You (or whoever put this mix together) have SRAM and Shimano in the same drive train. I suppose that's fine, but your problem would appear to be the Tiagra rear mech. You don't say whether you are running a 9 or 10 speed cassette, but either way you have exceeded the maximum capacity for the rear derailleur. I'm pretty sure the 9 speed Tiagra rear derailleur had a capacity of 27T (for the largest rear sprocket). The 10 speed long cage Tiagra rear derailleur (RD-4600-GS ) takes a maximum rear sprocket of 30T. So either way you have exceeded the manufacturer's stated limit. In reality these stated limits can be exceeded a little bit. But why risk it? As Jim says, this is mentioned in the original post. If you must go with 11-34 try a Shimano Deore (or LX or XT) rear derailleur as these are designed for the job. We had the same problem on the tandem with our 11-34 cassette. Bertrand changed our Ultegra rear derailleur to a Deore XT and all is fine now. Thanks for your interesting website. I have a Panorama also. I've found this to be a great frame for middleweight loaded touring as it is so stiff, but finding the gears to match that suit my pedalling style, and passion for touring in the high mountains took some time. Because the FD is set for the 48, there is a slight shifting issue in that it won't shift into the inner from the middle when in higher gears. In these situations, downshifting a few cogs will make it shift, otherwise this works very well for me! Getting together a bike right now to take on a charity ride following the Gior d'Italia this year, including all of the hills... I usually do push a pretty big gear, but given that I will be lugging all of my stuff (including tent etc.) with me I will need something at least semi reasonable. So looking to put on a 34-11 or maybe even a 36-12. My question is, If I get a deore 10sp rear derailluer is this going to work with the tiagra lever that comes on the bike I am looking at? 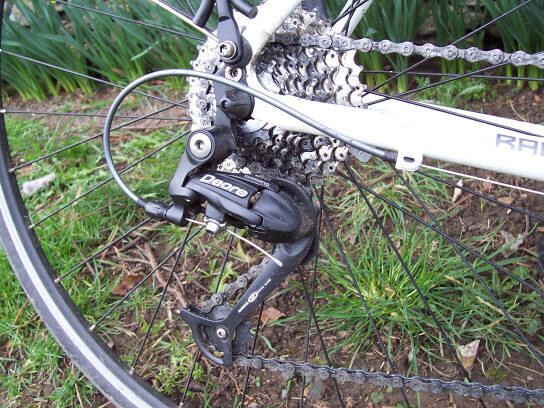 You may want to risk a standard Deore 9-speed derailleur, but it may not be accurate enough to work with a 10-speed cassette. Reviving an old thread for those that are keen to build their own custom cassettes. The pins holding the sprockets together also serve another function other than to make installation easier. They are designed to hold the cassette together as one unit to reduce the stress placed on the splines of the freehub body on the freewheel. 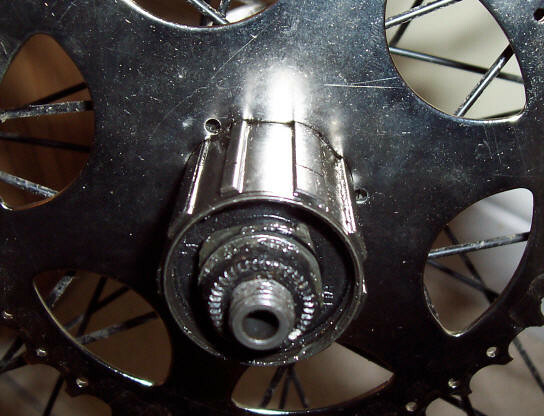 As most DIY bike mechanics will concur that as your bike stakes on the miles the sprockets will start 'digging' into the splines even on steel hub bodies, so it would be wise to reinstall the pins to hold the cassette together so the torque forces could be spread. Most will know that's why nowadays the largest 3 sprockets are held together by a 'spider' both to save weight and also to spread the stresses. Thanks for taking the time to read the post and leave a comment, Jay. The way you remove the rivets determines your options regarding replacing them. I found that once they are removed there isn't a lot to hold them together when you slide them back in place (contrast that to the threaded pins on my mid-80s Raleigh Road Ace with its Shimano 600 cassette). The most success I had with reusing the rivets/pins was when I experimented with countersinking one of the spacers and inserting the pins from the opposite direction. This kept the pins a little snugger as the heads were recessed and had nowhere to go, but in reality I'm not convinced that they were doing a great deal of work, especially when the lockring was torqued up. Having 'upgraded' to 10spd on the bike pictured above I now have exactly the same size sprockets that I had when running a customised 9spd cassette (with the addition of a 12T smallest sprocket – the XT cassette came with an 11T, but I took a 12T from an old 10spd Tiagra cassette – seems I still can't help 'customising' 🙂 ). Jay wrote: Most will know that's why nowadays the largest 3 sprockets are held together by a 'spider' both to save weight and also to spread the stresses. They are on the 10spd Ultegra cassette I fitted to my road bike, but not on the Tiagra cassette it replaced. 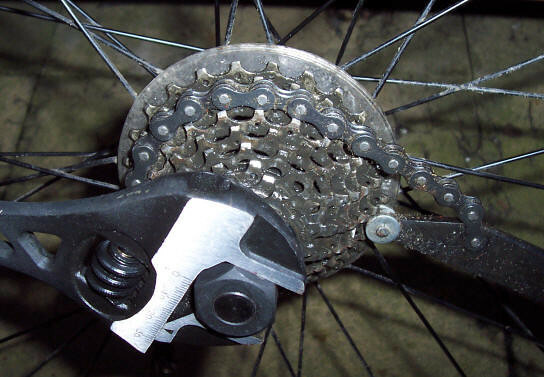 Now, I really can't remember if it was this XT cassette or the Ultegra one on my road bike (it was probably the Ultegra one), but the last time I fitted a 10spd cassette all the intermediate sprockets were loose on the freehub. Yes, the largest three were one a spider – primarily to save weight IMHO – and the two smallest were the lockring sprocket and (at least) one with the integrated spacer, but the other five (or so) slotted on loose on the freehub body – and they are the ones – for me at least – that get the most use by far. So I suppose the bottom line is refit those rivets if you want or can, but don't worry too much about it as – certainly some – Shimano cassettes have no pins and have loose sprockets as standard anyway. i have heard that the issue with front dearilleurs is the curvature and spacing of the chainrings being different, as well as thee cable pull being different. I have also heard that Shimano rear MTB mechs worked with all Shimano shifters up through 9-speed–only 10-speed (and up, I assume) road shifters and mechs use a different length of cable per shift. I have not used a Shifmate but I have researched a lot because I have a 10-speed Tiagra group with an 11-25 cluster and I want 11-32 or 11-34. I plan to go to a Deore derailleur to make Sure the whole thing works properly, and the Shiftmate should help the inter-group communication..
i have heard that the issue with front dearilleurs is the curvature and spacing of the chainrings being different, as well as thee cable pull being different. Okay, two things in that sentence: (i) assuming you are talking about the curvature being different for smaller chainrings compared with larger chainrings, that is correct, of course. In practice this means that if you fit a considerably smaller chainset you either (a) stick with the 'road' front mech and hope the 'sub optimal' performance is tolerable or (b) fit an MTB front mech and, as you say, a shiftmate to compensate for the different cable pull. With (a) and (b) on a 'road' bike there is also the added complication of mounting the front mech lower down on the seat tube: its ideal positioning may be difficult because of the location of bottle cage braze-ons; the tail of the front mech may strike the chainstay and the MTB front derailleur may be optimised for a chainstay angle which is different from that found on the road bike. I have also heard that Shimano rear MTB mechs worked with all Shimano shifters up through 9-speed–only 10-speed (and up, I assume) road shifters and mechs use a different length of cable per shift. I am going to leave 11spd rear mechs out of this discussion as I have no experience of them. 10spd MTB rear mechs will not work with 10spd STI shifters because of a different cable pull. However, if on a 10spd road bike fitted with STI shifters you fit a 9spd SGS rear mech (in my experience the Deore XT M772 'Shadow' mech is ideal) you will be able to fit a 10spd cassette with, say, 11-34T sprockets. That is what I did with the bicycle pictured above and it shifts better than the Ultegra set up on my other road bike. Great article, very close to what I've been wondering about doing so pleased to learn the shuffling of cogs is doable. I have an 8-speed HG50 that's 11-28T and like yourself I very rarely use the smallest two. So I'm wondering about buying a 10-speed HG50 11-36T and just installing the largest eight cogs. Do you think this would work or is there a factor that won't make it possible? 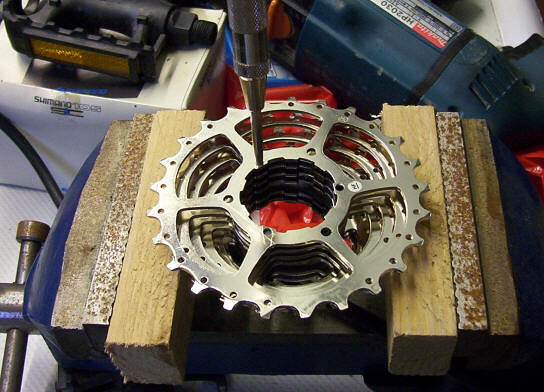 The smaller, lock ring sprockets have an integral spacer (as do some of the other smaller sprockets – it depends...), so I would expect you to use the first two or three sprockets from an 8 speed cassette and the spacers from an 8 speed cassette assuming 10 speed cassette sprockets are the same thickness as 8 speed ones. Have a look at the Shimano tech docs for the cassettes you hope to use before you waste any money? Best wishes – Chris.